This was a nice change to our usual Mexican night. It was like manicotti but with corn tortillas and enchilada sauce instead of pasta and marinara. We both really loved the cottage cheese and sour cream mixture. It was so creamy and yummy! To help cut down on the sodium in the dish, I used my homemade taco seasoning and enchilada sauce. I also cooked the chicken the night before to save time after work. Next time I might add some black olives, chopped tomatoes and cilantro. In a medium skillet over medium heat combine chicken, onion, taco seasoning and water. Cook 5-10 minutes, until water is absorbed. Set aside. In a medium bowl. combine sour cream, cottage cheese, salt and pepper. Set aside. Microwave tortillas for 30-60 seconds, until soft. Spoon 1/12 of chicken mixture in each tortilla. Top with a large spoonful of cottage cheese mixture and some shredded pepper jack cheese. Roll tortilla up and place in a lightly greased 9x13-inch pan. Repeat with remaining tortillas. Top with enchilada sauce and remaining shredded cheese. Bake for 30 minutes or until cheese is melted and bubbly. What a great idea! My family will love this. Based on your delicious mexican manicotti photos, we'd like to invite you to submit your food photos on a food photography site called http://www.foodporn.net so our readers can enjoy your creations. 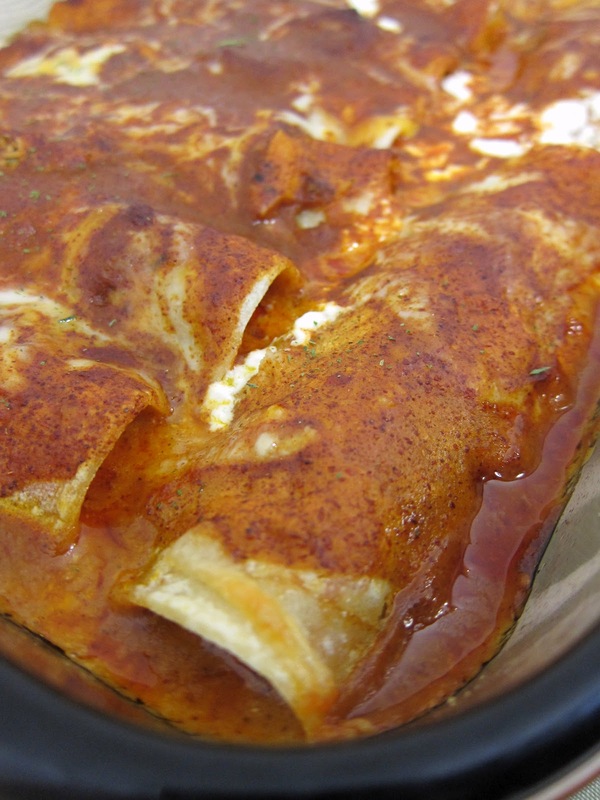 I'd be more inclined to call this enchiladas, but have you tried actually using manicotti to make it? I'll bet it'd still be good. SJerZGirl, I agree, this was more like enchiladas, but heck, they were SO delicious for dinner last night, I didn't care WHAT they were called, LOL! ;) Love Love LOVE this recipe, my mom even loved them and she doesn't like any kind of dairy at all... Wonderful topped with sour cream! This looks divine, Steph! Right up our alley. You're recipe was one of the best I've ever made! Thank you for posting this recipe and saving a Sunday dinner for me! It was delicious. @shortbustchr - so glad you enjoyed it!